Professional installation results. From large jobs to smaller jobs. All sorts of wall repairs solved quick. Helpful and very competent staff. Get your free estimate. Very easy to work with. You're going to like the way it looks. Would you like to get some new interior walls or ceiling installed at your home or business? Or maybe you have a ceiling or wall which doesn’t look great any longer. You would like it fixed. These folks specialize in drywall installs and maintenance. 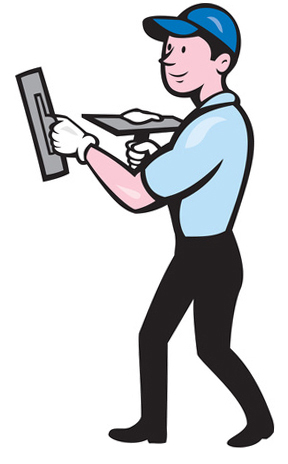 They take on jobs of many sizes – simple residential repairs, new houses, basement remodel or small commercial projects. Repair projects might include patching holes or removing and replacing damaged areas of sheetrock. They will work with the owner or manager of any type of property. Their crews can work on residential or commercial projects. 1. The order of drywall sheets is trucked to the job space. 3. The trash and extra material is removed, and the work area is cleaned up. 4. The joint seams and screws are taped and covered with joint compound. You could start painting your new surfaces once the final texture and last cleanup is finished. Most property owners will want to have them complete the whole job, but once in a while, someone wants to have them complete only some of the activities. As an example, in most instances, the interior of a garage will get drywalled, but it will not end up being painted, so the last stage of texturing and sanding is generally omitted. Or sometimes a property already has the sheetrock up on the walls and ceiling. They get asked out to do the rest of the taping, mudding and finishing work and make it all set for paint. They can also put in specific styles of boards, like moisture resistant boards to be used in bathrooms, or stronger boards that will be used to hold heavy tile. Accidents happen inside houses all the time. Sheetrock could get wrecked in numerous ways. It does not take much effort to put a dent or hole in a wall or ceiling. If the dents or holes in your wall or ceiling are pretty small, you might want to try to repair them by yourself first. Most homeowner installed wall patches don’t look that great. Patches normally take a little practice to learn the best way to do them right. A hole in a ceiling is more challenging to cover up than one in a wall. Experts suggest you get in touch with a pro to do a ceiling patch repair job, unless that ceiling is in an out-of-the-way room. When they are completing the work, they try to make certain the new wall or ceiling has the similar finish and texture as the old walls or ceiling. Fixing or patching one or two different holes or seam splits. Repairing a few trouble spots so an area or room can be painted. Removing and replacing sheets of drywall spoiled by moisture or something else. Completing the elimination and replacement of a whole room or two. Commonly due to a water malfunction or other serious event. They will correct just a couple of minor issues, they could carry out significant renovations, or do any project in the middle of the two. You have choices regarding the texture of your walls or ceiling. Entirely unfinished surface – only taped, best for non-finished work or storage places or garage areas. Smooth finish – no extra texture, waiting for painting or wallpaper. Complicated texture – height and dimension added and is more tricky to do. Texture match – your new wall surfaces match with your original ones. Many individuals are tired with the popcorn ceiling look. They will eliminate it for you and change it to a modern finish. And without much of a mess too. 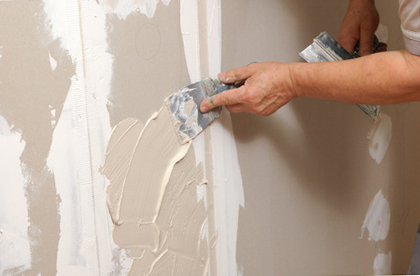 They are a hard-working group of experienced drywall installers and finishers. They attempt to accomplish quality projects at a sensible price that most homeowners can afford. They use good products, plus the finest equipment and safety equipment, so they can have your task completed as quick, and as safely, as they can. They do their best to hold the clutter to a minimum and protect your home and belongings from dirt and dust. Once your assignment is completed, they carry out all the trash that was generated and all the unneeded materials. They do an assortment of jobs. They complete fundamental sheetrock repairs, specialty work at expensive homes, and last-minute projects for business owners. They work for homeowners, building contractors, investors and commercial property owners. Your cost will be based mostly on the size of the project and how much of the project you would like them to do for you. They don’t have a sensible way to supply a cost quote by email, the easiest way to find out the likely cost would be to give them a simple call. What About All This Painting? If you wish to have them get started on the painting stage of the project, they can begin once the work is finished and dry. Some homeowners want to do all their painting. Others choose to use a different painter. Whatever you want to do is fine. Do They Work In Your Suburb? They work at homes and commercial properties in most areas around the city, often in neighborhoods such as Santiago High School, El Cerrito, Home Gardens, Corona High School, City Park or Centennial High School. They regularly work on jobs in most parts of the city, often in neighborhoods like Santiago High School, El Cerrito, Home Gardens, Corona High School, City Park or Centennial High School.